Software testing is an exciting and rewarding career. A good software tester is curious, technically skilled, and organized. Strong communication skills are also important, as software testers are responsible for reporting and documenting defects so that engineers can resolve the issues. With new technology and a constantly changing landscape of software products being released, software tester jobs can be found all over the world. Many industries are offering software testing jobs as the demand for high quality products continues to increase. Software testers are being employed for manual and automated testing across companies big and small. Start your search for a QA job here. Are you a hiring manager or a recruiter? Have your QA jobs listed below and posted on our social media channels for $100 (listed for the duration of 90 days). Contact us to get started! 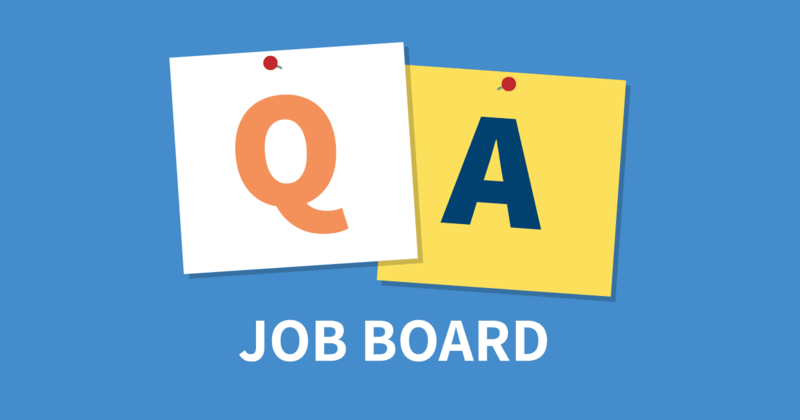 We’ve included links to some of our favorite QA job boards below. Start your search for a QA job today. Monster is one of the most popular job posting sites around. With Monster, you can search QA jobs by location, job title, company, and skill requirements. They also offer career advice and thousands of company profiles. LinkedIn is a popular social network for professionals. More and more companies are using LinkedIn to post their jobs openings, and more and more candidates are building their resumes there to connect with those companies. There’s no shortage of QA jobs to be found on LinkedIn. Indeed is a job-based search engine. The website aggregates job listings from thousands of other websites, making it a popular one-stop shop for job hunters. CareerBuilder is a job posting website that also provides labor market information and talent management software. They own and operate many CareerBuilder websites in other countries including Germany, Canada, France, India Sweden, and the United Kingdom. QACrossing was created by the Employment Research Institute and claims to be the largest collection of quality assurance and quality control jobs on earth. Many of the jobs listed there are software tester jobs. Modis is an IT and engineering staffing service that connects candidates to tech employers. They provide research data including salary reports, and general career advice for job seekers. Robert Half is a staffing service with offices spread across the united states. They specialize in many different industries including technology and IT. Focusing on simplicity, effectiveness, and transparency, No Fluff Jobs is a great resource getting detailed information about what to expect in a potential job. Job listings include information like company size, office hours, and work methodology in an easy to read format. Women Testers is a community of female testers across the world sharing information, best practices, and knowledge about the software testing industry. Latest Software Testing News is a favorite resource among testing professionals and students looking to improve their software testing skills. Their job board pulls in testing jobs from Indeed, and employers can also post jobs there as well. Software Testing News provides the latest news and information about the software testing industry. They also publish TEST Magazine, a bi-monthly publication that shares information on the processes, technology, strategies, and opinions around the software testing space. Like many career paths, a software testing career can be competitive, and the technology industry is changing at a rapid pace. It’s important to stay up to date on the latest industry trends so that you stand out as an expert. Attend conferences, network, and learn about how other companies are approaching software testing. Keep your resume update, polished, and easy to read. Lastly, job searching is a marathon, not a sprint. Happy job hunting!